Thanks to the kind invitation from the Jolla team, I will spend today in the conference. 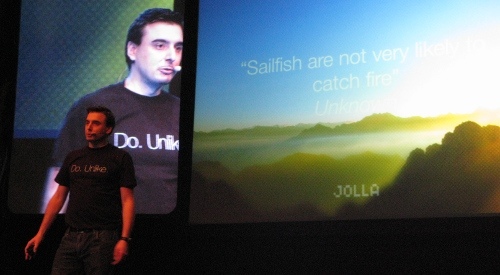 This post will include the things I learn about Sailfish, their new mobile OS. I’ve been equipped with a list of questions from the Maemo community, and will try to pry answers to some of those during the day. In the meanwhile, I recommend reading my Dreams of the MeeGo Diaspora post before this one to get the background on where Jolla comes from. Unlike with the smartphone giants, relatively little has leaked out on what Jolla will show us today. What we know is that they are working on a new OS for smartphones based on Mer and Qt. During Slush they will show the user interface and the SDK, but there should be no hardware announcements yet. Jolla Tides has a list of various gossip about the event. We’ll see how much of that holds true. 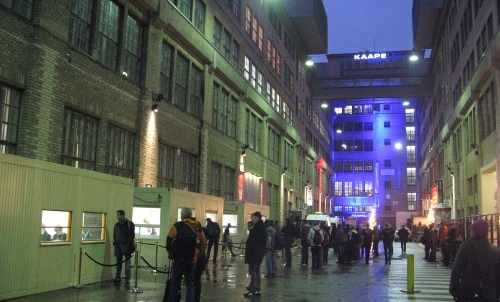 I arrived at Slush right around when the doors opened. 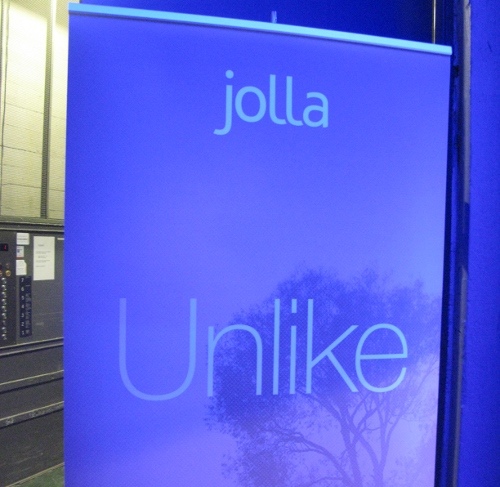 Quite a few members of the Jolla team were there already to set up their booth and prepare for the keynote. Looking at all the familiar faces makes this feel very much like a Maemo family gathering. 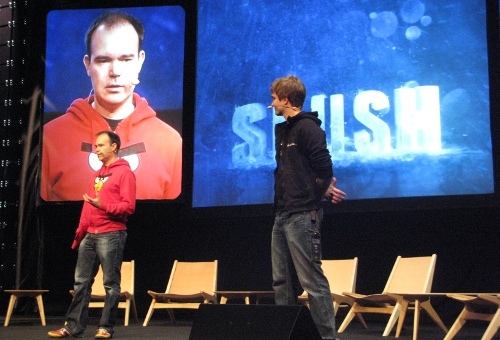 Before the event started, Jolla’s CEO Marc Dillon shared the stage in the opening press conference with other Finnish start-up notables like Peter Vesterbacka from Rovio. 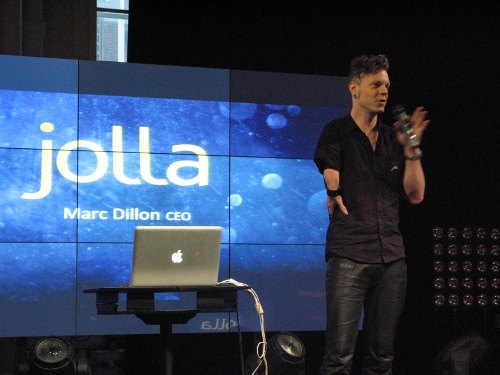 Jolla has grown very quickly from a start-up to a medium-sized technology company. The fact that Finland’s prime minister will be opening the actual event shows how important innovative new companies like Jolla are for the nation. In addition to Finnish companies, there are also 100 Russian start-ups attending. If you look at the markets nearby, there are places like Russia and China practically next door. I’ve never before been in an event where the prime minister’s nails get painted. Innovation. But seriously, we as a country have been losing market share in many important markets. The ways to solve this is through research and entrepreneurship. The focus on R&D was what lifted Finland from the recession of the early 90s. We want to become the largest hub of start-ups in Northern Europe. We need to create an atmosphere where new entrepreneurs and venture capitalists can meet in easier ways. There is also a wiki for Sailfish OS now available. 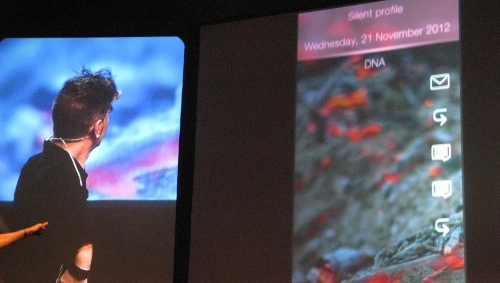 Another exciting pre-keynote announcement is that Finnish operator DNA will sell Jolla phones. A video of the launch keynote is available on YouTube. Jolla wants to add more partners to the ecosystem, and to ensure it is an open ecosystem where companies can put Sailfish on different kinds of devices, and create new things on the platform. It is a lot of fun what we do every day. I work with the greatest people in the world. The UI should also be fun for the users, for the consumers. We’re out there creating friendships and partnerships. It is all about working bilaterally. We’ve seen a company to build a business out of apps, and another company follow them on their terms. We don’t have to do that. The governance of Sailfish is about contributing. If a company wants to add a new technology or a standard, we’re open for that. Our guys are really staying up until 4am to see that we have Sailfish OS booting on the new hardware. This doesn’t happen every day. This is Open Source, it is stubborness, it is great engineering. 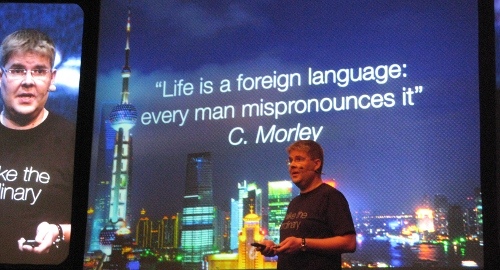 Open Source is about doing stuff. What if you could watch the development of the OS out in the open, and adapt your application little by little, instead of having to wait for the big code drop? Sailfish is the first mobile operating system that is really open 24 hours for your contributions, and your enjoyment. You out there are the interconnected organisms. We want to swim in the Open Source, we want to live and breath it. And when you’re in the ecosystem, you can contribute, you can affect the way things go. 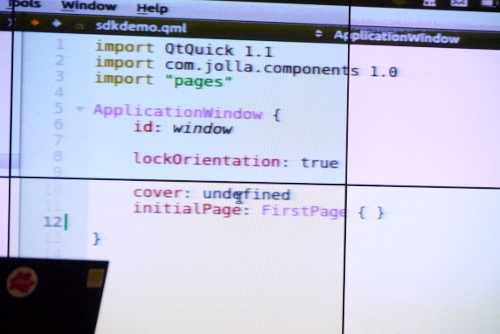 The SDK is based on Qt Creator and will be shown tomorrow. There will be Jolla-branded phones, always leading by example. They will be the spearhead of the Sailfish ecosystem. But partners and operators can also sell Sailfish phones on their own branding. Other smartphone vendors can also use Sailfish. We’re talking with several companies about this. This industry is at the moment looking for change. 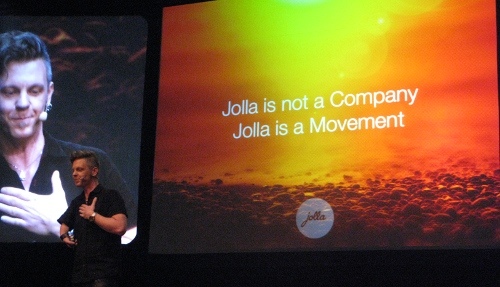 Jolla and its partners can be the change by disrupting how the industry works. We don’t have an existing business or cost base to defend. 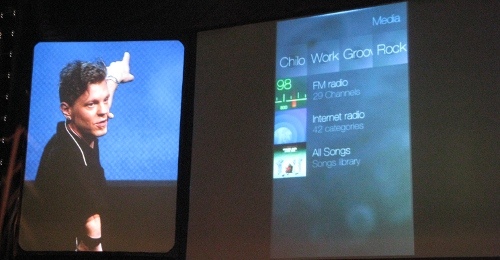 Marc back on stage, showing the Jolla UI video. There was an Android logo in one of the screenshots! Two taps on the screen activate the lockscreen. Scroll up and you’ll see status information, and finally get to the homescreen. Swiping up again goes to the apps listing. Sailfish has true multitasking, just like N9 or N900 had. When you open an application, the homescreen will have a large widget-like tile showing it. These widgets show status data from the app, and can have controls for the app, like pausing or forwarding music you’re listening to. This is true multi-tasking. You no longer have to go deep into an application to do something. You can leave your favorite applications open all the time. Swiping gestures change between views inside an app. The whole UI takes its ambience, its color scheme out of the picture you choose for the wallpaper. 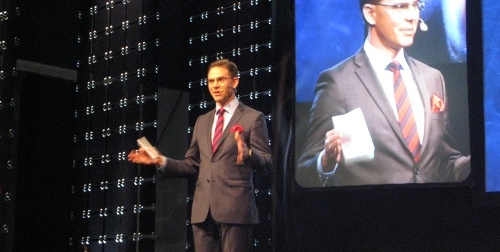 I had a chance to sit down and talk briefly with Sami Pienimäki, Harri Hakulinen, and Carsten Munk from the Jolla team. The Maemo community (and commenters of this blog post) had provided me with a set of questions, and here are answers to some of them. In general, the Jolla team was very happy with the demo and the keynote, stuff worked and people were interested, both on-site and online. 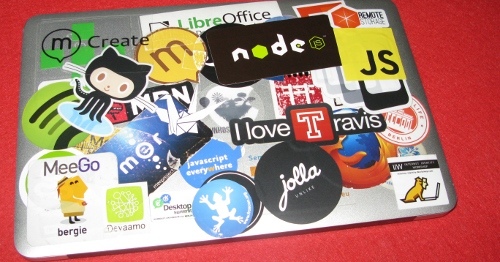 For developers, the interesting part is the platform itself. Mer is the core OS used, with various middleware pieces coming from the Nemo project. 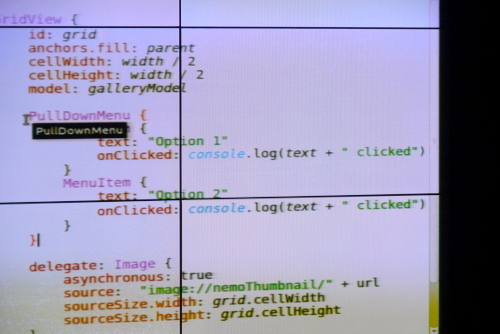 Qt Creator is used for building applications, with the Sailfish SDK being shown tomorrow. You can run Android applications on Sailfish. But native tools are encouraged. Sailfish can run Android apps but is not Android. More integrated UI needs Qt. And the application story stretches beyond just Qt and Android APIs. You can also deploy HTML5 apps via PhoneGap, as Qt Cordova runs already on Sailfish. We don’t like to talk about security frameworks. We talk about user privacy frameworks. The OS will protect user privacy. User privacy framework will be open sourced I also enquired about various things about the form factor that will be relevant to developers, like screen sizes and HW/SW keyboards, but there have been no HW announcements yet – as expected. 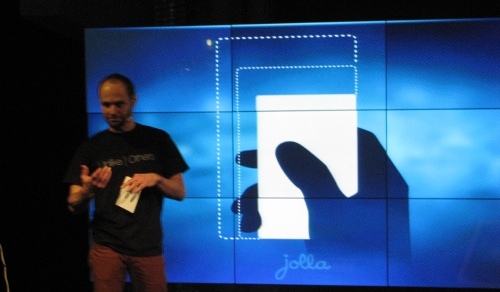 The first Jolla device will probably be out in the summer, at least for customers in China and Finland. There are ongoing negotiations also with other European channels. 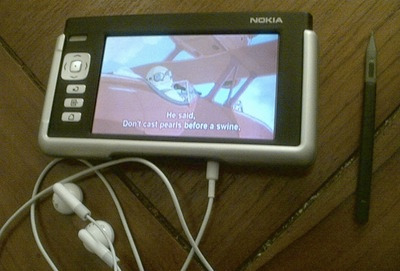 There may be a N900-like developer device program, but this depends on the partners. They want to ensure a program would make sense for both them, the developer community, and the operator partners out there. Sailfish supports chipsets from ST Ericsson, and can already run also on other chipsets, as well as a VM. ST Ericsson’s Snowball is a developer device that you can buy. 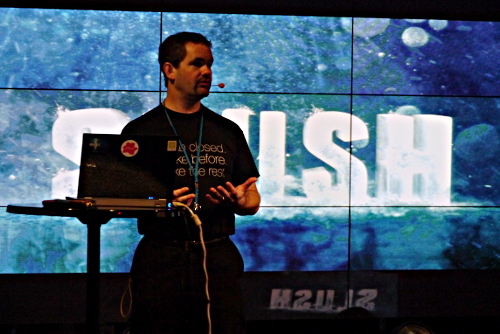 In the evening Jolla’s design team held another session on the Sailfish UI and the design philosophy behind it. The basic ideas behind it are simplicity and playfullness. Smartphones in general are getting bigger, but the UI has to fit your hand without having to use it with two hands or shift the device around. Multitasking is important. Normally, the apps take a full screen, but each of them also appears as a widget when either running or pinned to the homescreen. These widgets can present UI elements or data. No chrome where you want to just show content. The OS tries to be personal and customizable, unlike others. Honesty to the medium, which in case of current smartphones means glass. So, no fake leather or 3D icons. Vertical swipes take you between the lockscreen on the top, homescreen in middle, and app list in the bottom. Swiping left and right shows various views of an app. There are also gestures to show available actions, like changing between a VoIP or a regular cellular call. 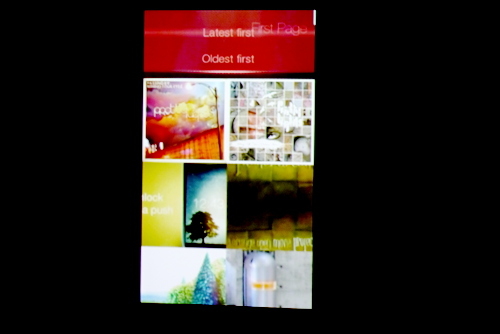 The Jolla team called these different views covers, and swiping pushing. Even the lockscreen has some UI options available via swipes, for example to switch the phone to silent mode. Everybody in Jolla team tests their work on actual devices, and gets constant updates on them. This way you can ensure performance stays smooth even on 100$ hardware. QML helps too. 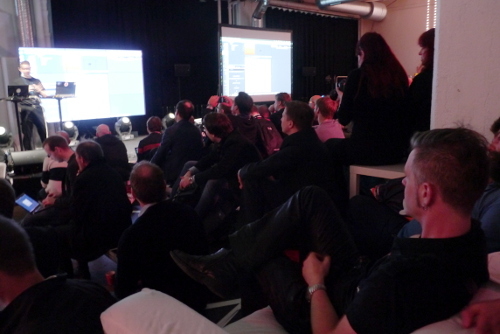 Today’s major Jolla event was the SDK demo. Watching the presentation, I felt like I’d already seen the same thing ten times. And I have. Anyone familiar with Qt and Qt Quick should feel right at home. Qt Mobility is available as well. As far as the individual app developer is concerned, Jolla isn’t making any radical departures from the existing frameworks. It remains an excellent way to develop a slick UI, regardless of whether you want to follow platform guidelines or customize everything (more on that later). The SDK is available in source form now, and we should expect binaries for multiple platforms in the coming weeks (a minor disappointment, but no big deal). Qt Creator lets you deploy your code directly to virtual machines or real devices, and you’ll be seeing stronger integration of Sailfish UI components in the near future. 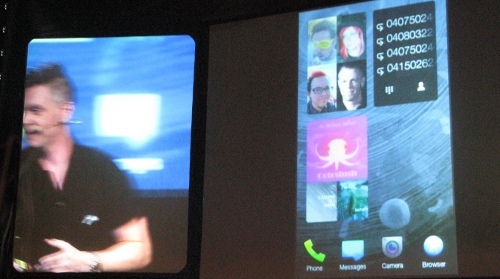 Jolla also encouraged anyone with questions about the build system to contact them. They want to make it easy to support multiple architectures, and even multiple versions of Qt. The number one thing to remember from this demo is that Jolla is open to people joining discussions online, and in fact strongly encourages it. They said they’d be very welcoming to people who show up on IRC with a good attitude, and want to release preview code early and often so you can help make it fit your needs before it becomes a more strictly defined finished product. 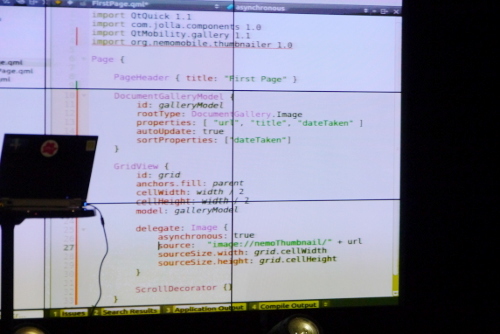 Apps developed using the SDK are Qt apps that can be run on Android. Many Android apps will already run on Sailfish due to an included VM. A lot of info will be available about porting apps to get native performance. The rest of the presentation introduced Qt Quick to those who haven’t seen it before. The following screenshots illustrate how to create a simple gallery app that adapts to the user’s theme (ambience). All in all, getting to that point took about twenty minutes, with Jolla estimating that it should take about an hour without preparation. You even get lots of animations for free by using the provided components. My personal impressions about Qt Quick are as positive as ever. 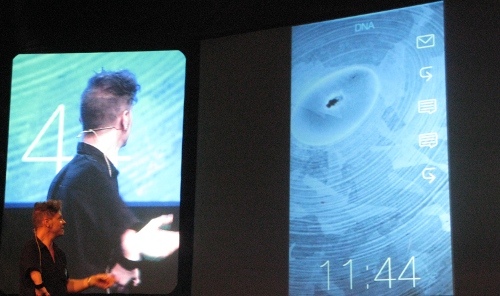 But seeing this presentation from Jolla instead of Nokia felt different - in a good way. Thanks, Jens! And also thanks to the Jolla team for the interesting presentations and the discussions in the Supercell party last night.